Three Identical Strangers raises difficult questions about how a 1950’s and 60’s psychological study was never made public, even to this day. Much of the data and conclusions remain unclear. In this study by respected psychologist Peter Neubauer, unsuspecting subjects were parents and their adopted sons who were systematically studied and tested. The abuse of power, lasting two decades in the name of science, is the underlying theme of Three Identical Strangers. Neubauer himself died in 2008 and bequeathed over sixty boxes of interviews, film footage and other raw data to Yale University with the proviso that it be sealed until 2066. His purported goal was to gather empirical data on children with the same genetic background in order to analyze parenting styles (“authoritarian” versus “permissive”) and address the issue of nature vs. nurture. Due to controversies over ethics and public opinion, Neubauer never published his research and the data remains sealed. The film starts in 1980 when three teenage boys accidentally discover they are triplets. Although they were intentionally placed with families of different socioeconomic classes, in different parts of New York State, the three nevertheless become aware of each other. The focus in Three Identical Strangers is on parenting rather than genetics. While the study was the only triplet study at that time, which followed siblings from infancy, many twin studies had been conducted in Nazi Germany as well as in the United States. The Neubauer researchers carefully controlled the assignment of infants to parents, withheld information about their biological parentage, and didn’t disclose that the children being adopted were part of triplets or twins, or had other non-identical siblings. Instead, the adoption agency told the families that their children were being followed for a study about child development. 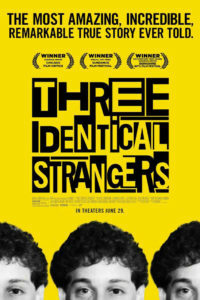 At a time when the zeitgeist is to explore one’s chromosomes through services such as 23andMe or family ancestry through organizations like Ancestry.com, Three Identical Strangers taps into our curiosity about DNA versus environmental predispositions. The film needed to reveal much more backstory about the relationship between the three sets of parents, and the adopted boys. This omission truly weakens Three Identical Strangers and leaves us wondering: What makes siblings differ radically, even if they share identical DNA? We also wonder what the ethical and legal standards were at that time. An historical perspective on how psychological studies have changed in the past half-century, as well as the legal rights of subjects, would have rounded out the film. Does Yale have any duty to unseal the study? Should researchers review the findings and share them? This is worthy of renting, but not leaving the house for the theater. Hey, I want to see this movie. Waiting for a friend who’s in Europe to return. We’ll go together. I know a bit about what happened. Ugh. What about ethics?. Thanks for the review…I will wait for the movie to come to Netflix or Amazon.